Important notice: Don’t upgrade your Pr 2017. 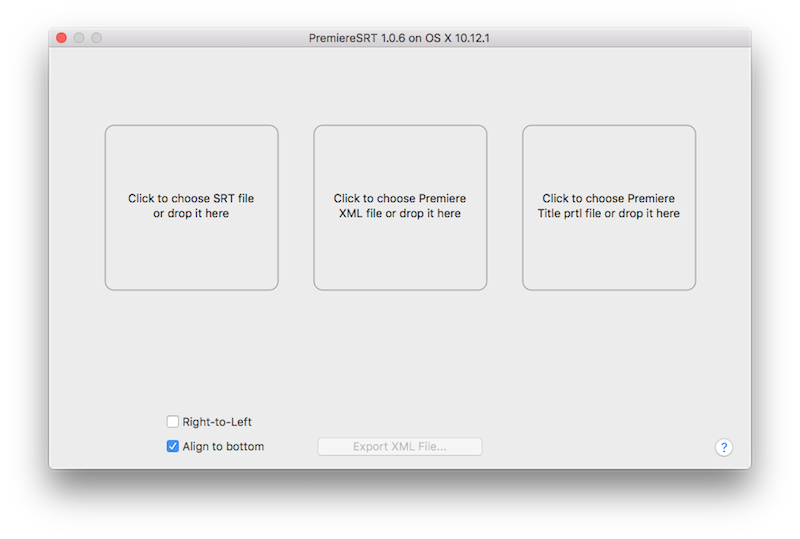 Pr 2017 newest version changed a lot about Title, it makes PremiereSRT not working. We are trying to fix this but it seems Adobe got its own problem. When you export a prtl file from new version Pr, then you import it back in Pr, Pr just keeps crashing. I think it may take some time for Adobe to fix this. I will adapt to the new version as soon as possible. Sorry for the inconvenience Caused. Most problem might be solved by following these instructions. If problem is still there, please email to helloliubin@gmail.com and attach your original xml, SRT and prtl Title file, note the version of Finalsrt and FCPX as well. 1. Only Adobe Premiere Pro CC 2014 and up is supported. Check your Pr version. 2. If there is warning message importing subtitled xml to Pr, please try to import the original xml to Pr to check if this original xml is ok. If it’s not ok with original xml, then the subtitled xml won’t work either. 3. Cannot see subtitles in Pr? Try to zoom out the timeline to fit the screen. This is because the SRT subtitles may not start from 0, it starts like 01:00:00.00 or even more. You can adjust the timecode to start from 0. 4. SRT file error: Check if your SRT file is in standard format, sometimes enduser doesn’t get a SRT, though its name is in .srt extension. Standard format should be exactly like the following. Note, the last 3-digit is millisecond, not Frames. 5. 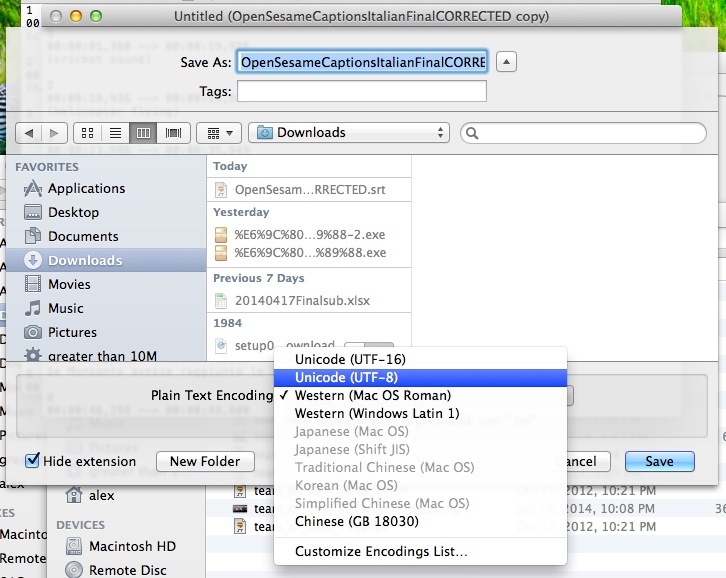 SRT file encoding error: If the srt is not acceptable, please try to open srt file in your editor and save it to a new .srt file with UTF-8 encoding. 6. 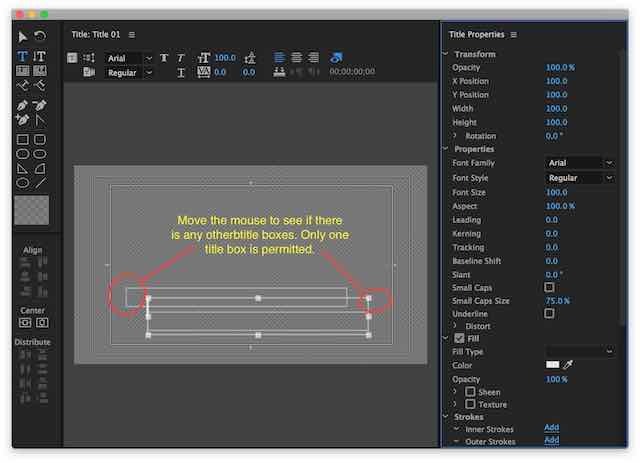 Cannot align center: Please drag on the canvas to make a subtitle input box, NOT just click once to input. 7. Error message about prtl Title–We found that you SRT subtitles has 2-line subtitle, but your prtl title template has only 0-line. Please make sure there is only one title box in prtl file. Here is a sample title for your reference. 8. 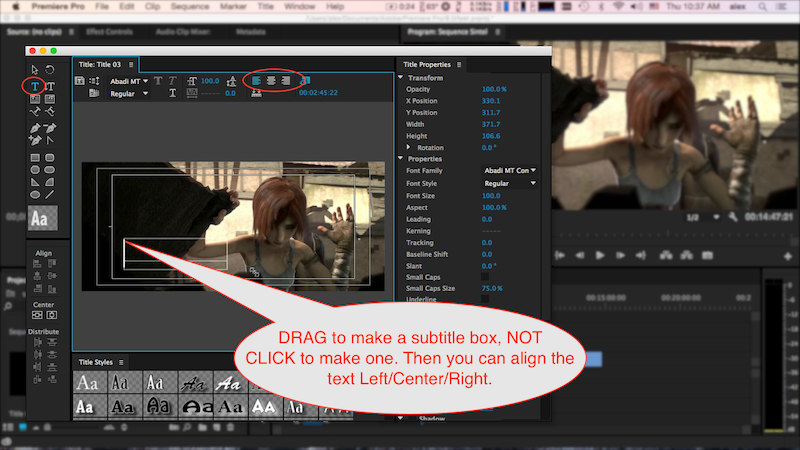 Align to bottom and Arabic Right to left aligning: Make sure check the box Align to bottom or Right-To-Left on PremiereSRT interface. 9. SRT italic: Many users want PremeireSRT to mirror those Italic symbol in SRT file to Premiere. It’s so complicated since descriptions in PRTL has too many different rules to apply to even just one font. Some font has Italic, some doesn’t. The font has a different name when you apply Italic. So we cannot do this properly. How can i switch it to english? Submitted a fix version 1.0.7 to App Store already on Feb 12, 2017. How do we get a .prtl from premiere pro cc 2017 April? PremierePro cc 2017 Arpil update doesn’t support export title. How should we export prtl files right now? Do you have any plan in the future? I didn’t updated it yet. If Adobe doesn’t provide this export option, then it won’t work and I just cannot do anything about it. So sorry. Do you plan on upgrading the app to work with newest version of Premier Pro (April Update)? since last Adobe Premier Pro upgrade, 2017.1 V11.1.0 (222), i can’t export title in .prtl file. Could you check please ? Does anybody else got this problem ? Could you please send screenshots to me since it works on my Pr 2017. Thanks. Check your Adobe Premiere Pro version. If you got 2017.1 V11.1.0 (222), then there is not way to export title in a .prtl file. I asked Adobe team… and i had to downgrade to an old version (2017 V11.0.0 (154). In fact, in last version, Adobe changed how to handle title templates.